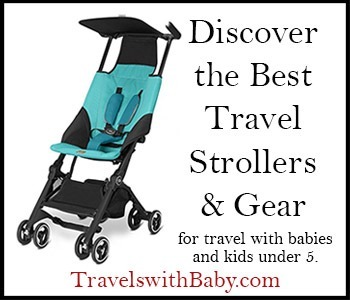 PANAMA WITH KIDS, Panama City – If you were to compare Panama City to some other capitals in the world, it would seem more like a tropical village than a seething metropolis. But that’s just one of the many reasons why this commercial hub of the Americas is a great family destination. You can explore the UNESCO World Heritage Casco Viejo (old quarter) in the morning and either the beach or the rainforest in the afternoon. Safe, easy to navigate, and with family-friendly attractions including the Panama Canal and the wonderful Biomuseo, Panama City is an ideal stop for a day or two before you head out to explore the country beyond. If you plan to visit Panama City with kids, here are 4 great things to do, 1 great place to stay, and 1 great place to eat to make the most of your time here. First stop! When visiting Panama City with kids (or without), head to Casco Viejo. Your first port of call when visiting Panama City has to be Casco Viejo, the old quarter. This UNESCO protected corner is the capital’s historic quarter and a characterful place to explore. 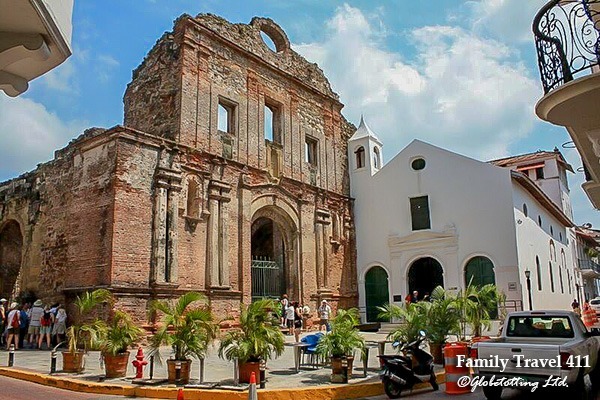 Also known as Casco Antiguo or San Felipe, this neighborhood was settled in 1673 after the near-complete destruction of the original Panama City when it was attacked by pirates. In the 1950s it fell into disrepair but has recently enjoyed something of a makeover and the historic homes and government buildings today house restaurants, museums and shops. Casco Viejo is a fun place to simply wander the cobbled streets and a great place to buy souvenirs, including Panama hats for all family members! The market just off Plaza Catedral is full of colorful crafts including molas and hand carved taguai nuts. Once you’ve done that, stop in at Granclement for what is, quite simply, the best ice cream in Panama. Tip: The area is lively at night and generally safe but don’t stray too far from the central hub. Biomuseo in Panama City, Panama. Hands down the best museum in Panama is the Biomuseo, which opened in October 2014. Even if you don’t go inside (although you would be missing out! ), it’s worth visiting to witness the origami-like structure in the kind of bold colors usually found in a Lego box. The museum was designed by Frank Gehry and took 10 years to construct. The Biomuseo sits on the Amador Causeway, at the entrance to the Panama Canal, and was created to showcase Panama’s incredible biodiversity – can you believe that this small central American country boasts 125 endemic animal species, 218 mammal species, 226 reptiles and 950 birds?! There are eight galleries within the Biomuseo but favorite with my kids is The Panamarama, a three-story projection space where 10 interactive screens line the walls, ceiling and floor, showcasing Panama’s ecosystems. Find yourself in the rainforest in minutes flat on your visit to Panama City with kids. Not many cities have a rainforest but Panama City does! Smack, bang in the middle of the capital is the Metropolitan Park, a 265-hectare green space that’s home to a smorgasbord of plants and animals. The Park has three main trails, which are well maintained and marked, although not very stroller-friendly. The most popular trail is ‘Sendero Cienequita, a one-hour walk that includes a lookout spot from where you can see the city, the Bay, the Panama Canal and beyond. Popular with kids is the small lake home to a handful of turtles; mine like watching them nibble leaves! If you do visit, then bring plenty of water. It’s hot and humid in here, especially during the rainy reason. Up close look at the locks of the Panama Canal at Panama City. A trip to Panama wouldn’t be complete without seeing the Panama Canal. This man-made, 48-mile (77km) waterway links the Atlantic Ocean with the Pacific Ocean and recently celebrated its 100th birthday. It’s an incredible feat of engineering and the museum and visitor center at Miraflores locks allows you to get up close and personal with the canal traffic. The facility has various exhibits and several viewing platforms; my kids love standing on the top deck and waving at passengers on cruise ships. Note, the boats that pass through here are huge! Expansion locks were opened earlier this year, which means that ships can now pass in both directions (previously it was only one-way). Particularly popular with kids, including mine, is this interactive gallery on the third floor where you can try and navigate your way through the locks on a simulator. Another great way to experience the canal is by taking a tour of the backwaters by boat. This can be arranged by Gamboa Rainforest Retreat (click here to read my full review of the Gamboa Rainforest Retreat). American Trade Hotel in Panama City, Panama. One of the newest hotels in Casco Viejo, and the one that I would definitely book if I didn’t happen to live here, is The American Trade Hotel. Housed within a beautifully restored landmark building in the heart of the old quarter, this 50-bedroom boutique hotel is one of the finest in the capital. Antique and modern furniture sit side by side, colorful tiles characterize rooms on the ground floor, and balconies overlook that most coveted of family travel requirements, a swimming pool. Most rooms are a standard configuration but the American Trade Hotel welcomes families. And if you don’t stay here, come to drink or dine instead. Who needs linen tablecloths? Fish tacos at Fish Market. This is not the place to come for white linen tablecloths and waiter service. It is, however, wonderfully atmospheric and serves delicious food. The Fish Market operates out of a mobile van parked within the ruins of a derelict house, where diners munch their way through BBQ prawns, ceviche, seafood laksa, and more at wooden picnic tables. It’s only open for dinner (6-11 p.m.) and doesn’t take reservations, but if you arrive before 8:30 p.m. you usually get a table. My personal favorite are the fish tacos, which never disappoint! Timely- we have talked about Panama City for a family visit in the next few years. Thanks for the tips!